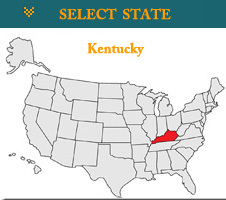 Kentucky.How to Get a Kentucky CDL License? There are three types of trucks that require a CDL license in the state of Kentucky. A Class A vehicle is called a combination vehicle. It weighs over 26 thousand pounds or more and tows vehicles that weigh 10 thousand pounds or more. Class B vehicles weigh less than 26 thousand pounds and tow other vehicles that weigh less than 10 thousand pounds. Class C vehicles weigh less than 26 thousand pounds and are used to transport more than 16 people or to transport hazardous materials. In order to obtain a Class A, Class B or Class C CDL license in the state of Kentucky, you must be at least 18 years old. You must also already have a valid license to drive for the state and you must pass a vision exam and have a medical certificate. Keep in mind that crossing over state lines is federally regulated, so you must be 21 to leave the state of Kentucky with your CDL license Driving school and subsequent testing is required in order to receive your CDL in Kentucky. The first test will be general knowledge and features questions that refer to basic traffic laws and how large vehicles must work to obey them. The written test covers information from the Kentucky CDL Manual. The second part of the test is a skills test and requires successfully completing a pre-trip inspection, knowing the basic controls of your vehicle and a road test. The vehicle you use for your road test must be the same type of vehicle that you plan to drive with your license. If you plan to drive a vehicle that transports hazardous materials, a school bus, or vehicles with air brakes, you will need other endorsements. You will also need to have a background check done by the Transportation Security Administration if you plan to transport hazardous materials. Class A: Any combination of vehicles with a gross vehicle weight rating (GWVR) of 26,001 lbs or more, provided the GVWR of the vehicle(s) being towed is in excess of 10,000 lbs. Class B: Any single vehicle with a GVWR of 26,001 lbs or more, or any such vehicle towing a vehicle not in excess of 10,000 lbs GVWR. Class C: Any single vehicle, or combination of vehicles, that does not meet the definition of Class A or Class B, but is either designed to transport 16 passengers or more, including the driver, or is placarded for hazardous materials. Many states make exceptions for farm vehicles, snow removal vehicles, fire and emergency vehicles, and some military vehicles.